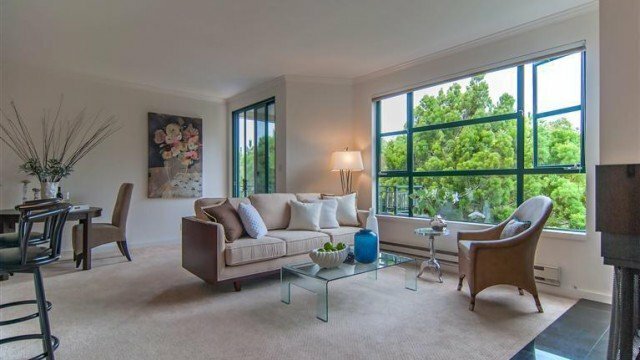 1440 Broadway is perfectly situated in Nob Hill near Upper Polk Street. This neighborhood has it all: shops, restaurants & nightlife. The building features a lush courtyard with BBQ, deeded storage and parking. Unit #302 is a spacious rear-facing 1 bed/1bath condo with a wood-burning fireplace and recently installed designer carpet. The private balcony overlooks the peaceful garden courtyard. The kitchen opens to the living room and features a breakfast bar, granite counters and stainless steel appliances. Just off of the kitchen is an area perfect for a dining area or home office. The spacious closet in master suite includes custom organizers and the bathroom has been updated with a granite vanity providing plenty of counter space.